Here is an easy and fun craft you can do with bits of clear plastic and permanent markers. I have collected clear plastic trays from fruit and other groceries and yoghurt pot covers for this craft and a massive set of Sharpies was going cheap at supermarket. To do this you need to draw the outline of your drawing on one side of the plastic and let the child colour on the other side (otherwise the outline will be smudged by other markers). If you are not good at drawing – you can trace over a picture in a colouring book like we did, or just let kids do their own design. We drew butterflies and glued them to some thin bouncy grass-type sticks and kids were playing with them all day “flying them around”. 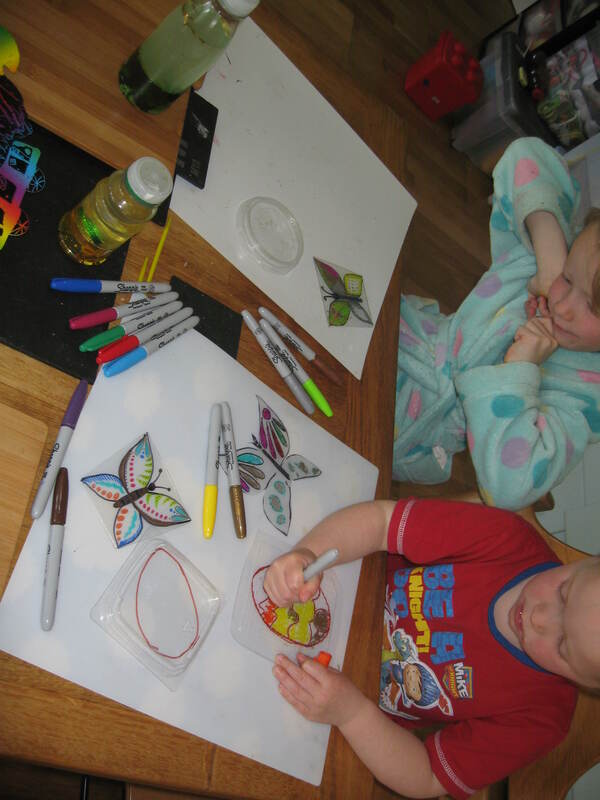 Additionally you can do some nature studies and print real butterfly designs to trace and decorate. Girls couldn’t get enough of this, they’ve drawn on all the plastic bits I’ve collected. Just make sure you protect your work place because they are permanent markers, and don’t let kids draw on themselves. Good luck!